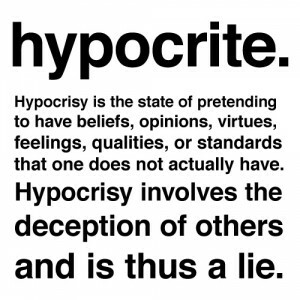 The term hypocrite has been a favorite excuse, for people, to express their reason for not attending church. They have positioned themselves as a judge for God. Unfortunately, their excuse is inexcusable, according to scripture. One who puts on a mask and feigns himself to be what he is not; a dissembler in religion. Our Lord severely rebuked the scribes and Pharisees for their hypocrisy (Matt. 6:2, 5, 16). “The hypocrite’s hope shall perish” (Job 8:13). The Hebrew word here rendered “hypocrite” rather means the “godless” or “profane,” as it is rendered in Jer. 23:11, i.e., polluted with crimes. Luke 6:42 How can you say to your brother, ‘Brother, let me take the speck out of your eye,’ when you yourself fail to see the plank in your own eye? The first question would be to those, of us, who call ourselves Christian. Are we hypocrites, according to the above definition and from our understanding of scripture? I question my own walk. Is it an hypocritical walk or is it a Christ-like walk? Today we often hear people describe life-threatening situations or disasters as ‘hell on earth’. While some tragedies may have lasting effects, for long periods of time, and may even linger a lifetime, they do not last forever. But is that the case with those who find themselves in hell? Jesus spoke more about hell in the New Testament than He did about heaven. Because of the attention given to hell, we can conclude that He felt it necessary to make sure that people were warned about the necessity of avoiding hell at all cost. Just as we cannot accurately describe the wonders and glories of heaven, we cannot be sure of the horror or suffering of hell. In Matthew 25:46, Jesus speaks about the destination of the righteous, or true Christians, and that of the unrighteous or unsaved. The words used to describe the length of time one would exist in heaven or hell are the same in the original Greek text. Also, in Revelations we are told that the Antichrist was in the ‘lake of fire’ for one thousand years before Satan was thrown in, which indicates that there was no extermination during that period of time. Even without suffering of any kind, it is obvious that to be found in hell is to be separated from God and all the joys and privileges that He has prepared for those who spend eternity with Him in heaven. Do you believe in a hell of eternal punishment? What do you believe hell says about God? A minced oath is a euphemistic expression formed by misspelling, mispronouncing, or replacing a part of a profane, blasphemous, or taboo term to reduce the originalterm’s objectionable characteristics. There is no specific reference in the Bible to indicate that gambling is a sin. But that does not mean that the practice of gambling is not unacceptable or an offence to God. Just as there is no mention of abortion or drug usage in the Bible, and we know that these actions are doubtless sinful, we can be certain that gambling should not be condoned or participated in by Christians. Besides that fact that gambling is an activity that results in obtaining money that is unearned, the motivation for gambling is often greed or covetousness. Paul, in Philippians 4:11 said that he was content in whatever circumstance he found himself in. Christians who are trusting God to supply their needs will have no reason to resort to gambling to improve their lot. Gambling is a habit that often becomes an addiction and has frequently led to financial ruin of families and relationships. There is also an inordinately high suicide rate among those who have become addicted to gambling. God expects Christians to earn a living through legitimate labor or investment and not rely on chance, which is the basis for winning at gambling. Do you think it is a sin from God’s point of view? If not, why? Do you know anyone, that has been seriously hurt financially and in their relationships by gambling?